The ligaments of the wrist are external to the wrist and internal to the wrist. The wrist is made up of eight carpal bones connecting the forearm to the hand. 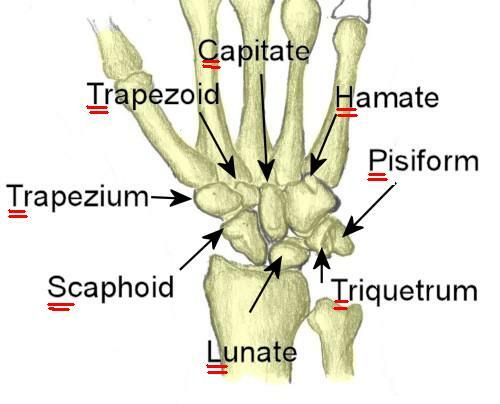 The eight bones of the right wrist (carpus) viewed from the front. These bones are interconnected with a series of ligaments. Since these ligaments are inside the wrist—they are called intrinsic ligaments. The next layer of ligaments lying more superficial than the intrinsic ligaments are the extrinsic ligaments. These ligaments are not as dense or as strong as the intrinsic ligaments. The extrinsic ligaments, note these ligaments may span 2 or more joints. Patients with a wrist sprain typically complain of pain, bruising, and swelling. Typically the injury occurs after a traumatic event—like a fall. After taking note of the symptoms, the surgeon inquiries regarding any pertinent family or medical history. A physical exam centers on the injured limb. Although unlikely, injuries to the adjacent shoulder and elbow are determined via checking for pain and motion. An examination of the sensation to the hand is performed. Sometimes patients with wrist sprains may have injured the nerves associated with the hand. The most common nerve injured is the median nerve, resulting in numbness in the radial three digits of the hand. The blood flow to the digits is checked. Swelling from the sprains may cause compression of vascular structures leading to changes in blood supply to the hand. Any deformity of the hand or wrist is also noted. X-rays of the wrist are obtained and if there is suspicion of injury to the hand, elbow or shoulder these may be obtained as well. Although x-rays do not image soft tissues, such as ligaments, they are the first line evaluation in looking for fractures of the limb. X-rays help delineate the type of fracture, displacement and if the fracture extends within a joint. Typically routine x-rays are sufficient, although they may be taken from many angles. At times, enhanced imaging including CT scans or MRI is a helpful adjuvant. MRI imaging can be helpful as it can image soft tissues and detect tears of both intrinsic and extrinsic ligaments. 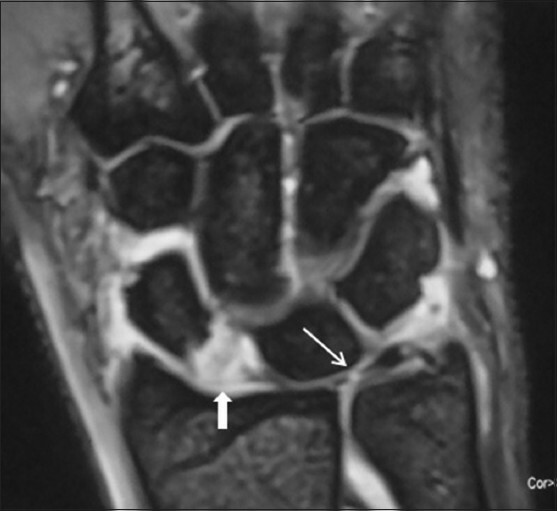 MRI can also uncover occult fractures of wrist bones—particularly the scaphoid. 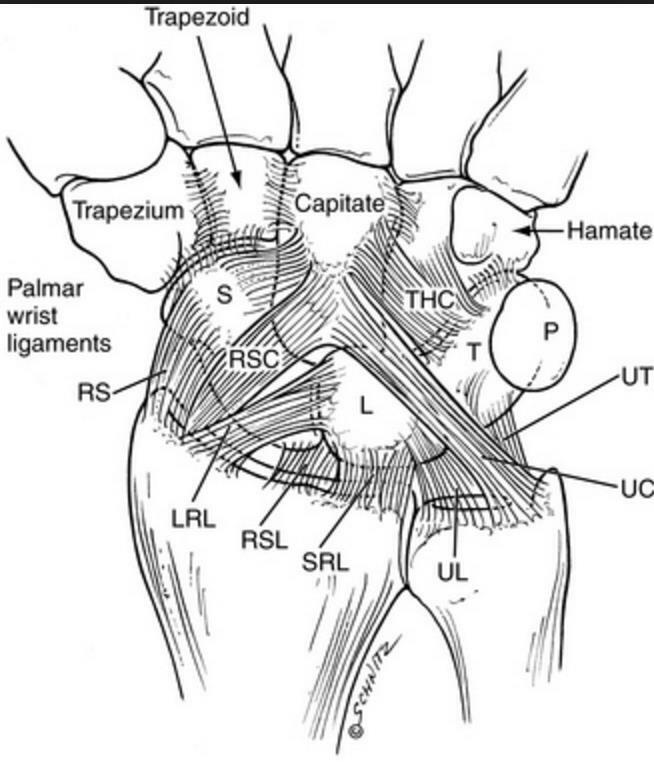 A right wrist frontal image showing a tear of the scapholunate intrinsic ligament (bold white arrow) and tear of the central portion of the triangular fibrocartilage complex (narrow arrow). Wrist sprains of the extrinsic ligaments are typically managed with splints, casts or braces. The length of immobilization may vary and after immobilization work is aimed at restoring wrist motion. Therapy for wrist and hand is common after these injuries even without surgical treatment and may require the utilization of a hand therapist. 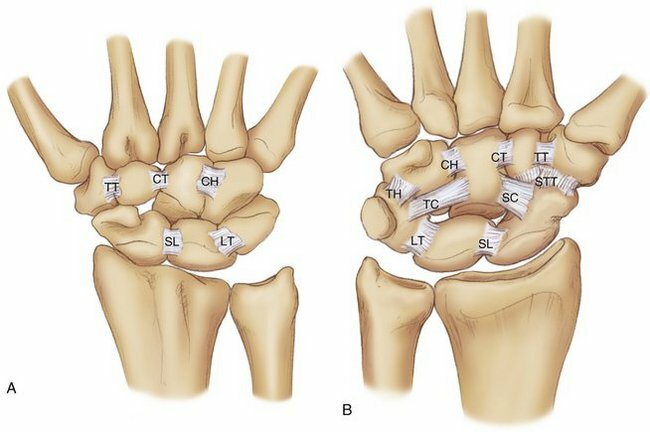 Intrinsic ligament tears to the scapholunate ligament if undetected lead to progressive arthritis of the wrist termed scapholunate advanced collapse syndrome. Early diagnosis and treatment of this tear is usually recommended. Operative treatment centers on repairing the ligament and holding the associated bones stable with pins while the ligament heals. Late reconstruction of this ligament has been described, but long term results are still evolving. Most wrist ligament surgery can be completed as an outpatient surgery and the majority done under regional anesthesia. The typical incision is on the top side of the wrist approximately 3 inches in length. For most patients, blood loss is minimal and unless there are medical indications—prophylaxis for deep vein thrombosis is not necessary. Other risks of surgery are small and include infection, bone healing, tendon rupture, and stiffness. Patients are placed into a splint after surgery and typically return in two weeks for suture removal. Patients who receive regional anesthesia report less pain after surgery, but all patients should follow instructions regarding pain medications to improve their postoperative experience. After surgery patients are instructed in elevation of the extremity and work on range of motion for the digits. By six weeks to 8ght weeks after surgery, most patients will have pins removed and transition into bracing. Work on range of motion for the wrist can be with the help of a hand therapist. Strengthening of the hand, wrist, and arm are emphasized and most patients should gain improved use of their wrist and hand—especially with diligent work on motion and strength. Modern ligament care has greatly improved the results for patients. However, patients can still expect some degree of stiffness with any fracture care. Return to sports after injury typically requires 4-6 months. Patients report continuing improvement for up to one year after injury.